Austin did my service himself. He was prompt and thorough. A good experience. I’ll have them do my annual service every time. Always very professional. Pure water educates and encourages timely healthy water services. They are efficient at scheduling and share savings specials. Jim came through again with his fine water knowledge, not to mention sense of humor. Was thinking about changing to a different system, but after a little chat with Jim decided to stay with the Hague. We've had a Pure Water Inc. system connected to our home for the past 18 years. We have a well and when we first bought our home our water had a very high sulphur and mineral content. Ugh! The installation of our Pure Water system instantly corrected our water and we have enjoyed fresh, clean spring tasting water ever since. The Team at PW has been excellent over all these years. Jim has been our annual service technician for I think over a decade now. He is knowledgeable, professional, and a really nice guy to work with. He KNOWS our system in and out and I trust he gives the best service to our system every year. When it comes time to replace our almost 20 year old system, (amazing by itself!) we'll go no place else but Pure Water Inc.
Nick was prompt, thorough, and friendly. He answered all my questions and explained everything completely. Highly recommended. Jim was the same person who installed the new unit 2 yrs ago and did last years service. It's nice having the same person with kept notes. Arrived by the time given, went right to work. Appreciate the time he took to explain the result and recommendation. No issues. 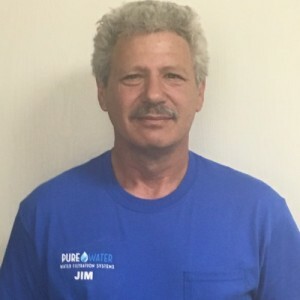 Jim C. at Pure Water Inc has always remained professional and punctual during scheduled water maintenance appointments. I appreciate him and Pure Water Inc. for keeping the water softening and filters in-specification and working conditions. On behalf of my family, I highly recommend Pure Water Inc. and Jim C. for your water filter and water softening needs for your home. Nicholas performed the annual service for my water softener filtration system. I found him to be extremely knowledgeable and efficient as well as friendly with a very positive attitude. I could not be more satisfied! Service was excellent. Got a few useful tips regarding usage of the water softner system. We are writing this review for 2 reasons: 1)	Normally we do not write a review, unless we am moved to share our experience with a business (positively or negatively) with the genuine purpose of educating others seeking input which would help their decision to either go with a business or look for alternatives. 2)	The service pro for Pure Water Inc. (Jim C.) has been servicing our soft-water system for over 10 years, so we’ve had the opportunity to get to know him better as a professional service technician. We inherited our soft-water system, when we purchased our house. Over the years, learning how important balancing our well-water has been a progressive journey, all in part by Jim’s credible willingness to educate us…(not salesman ship, but in years of knowledge, in his experience of delivering better, more productive water, while protecting the investment of owning a home, with a well.) Annual servicing was at first seen as “why spend the money?” - now we’ve learned that as long as our Hague Soft-Water System (AJQ WaterMax) is functioning effectively ( 14 years) – continuing with our existing system makes the most sense. When this system finally gives up the ghost, we know there are better technically advanced water systems now. (Ours was installed in 2001) Our review is based on receiving Jim C’s excellent service. Jim installed our system and has now serviced it a year later. Jim is fantastic and meticulous in helping customers. He is a joy to have at our house and on our property and goes the extra mile. Pure Water is fantastic and we have no buyers remorse on spending the money we did to have the best water system for our family. I bought a new Pure Water system to soften my city water. Now my water was was pretty good already. Within 6 months a valve failed in the system and it began leaking water. They came out and replaced the part, but charged me $185 for the service call. I feel that was poor customer service relations. They should have gone after the manufacturer for this cost or at least covered it since they did the install and the system wasn't abused and water is city water. It was only 6 months old. The technician arrived on time and serviced my indoor reverse osmosis system, and my outside whole house water softener system. He completed both jobs with no mess - which is especially important on the indoor job - and no need to unnecessarily replace parts. The estimate for the service job came in as the final price charged with no surprises. Nick of Pure Water went above and beyond in servicing my water softener. Tree frogs were dead in the softener and he sanitized the unit, put in salt and leveled the unit. Nick was awesome! Very helpful and professional! We purchased one of their systems after research and a professional sales presentation. The service has been outstanding in maintaining the equipment. Jim C and Austin at Pure Water Inc go above and behind to make you feel like your happiness is all that matters. Austin was very low pressure sales and very informative about the products. Jim said he was going to do the installation as if he was doing it on his own home and he delivered big time! Clean, Clean, Clean! Over 30 years experience really shows. Fun to talk to also! Thanks again Jim and Austin! God bless you and yours. Jim did Maintenance on our Water System yesterday and he is always has a smile, as well as professional, courteous and very knowledgeable. We would highly recommend Pure Water for your water needs! My experience with Austin and Jim from Pure Water was fantastic. Austin promptly responded to my request for a quote and information on a whole house system. He represented himself very professionally and provided me as much information about his system as I asked for (trust me I had tons of questions and concerns about these water systems). He was honest and explained the entire process to me as well as walked me around my house to show me how the drainage would appear and to finalize where I wanted it installed. His system installer, plumber, Jim was equally as awesome and his work was perfection. He went above and beyond when I had questions about the drainage and system and made sure that my drainage and system was installed to code. Both Austin and Jim honestly exceeded my expectations and I highly recommend Pure Water and their professional team. After a high pressure sales pitch, I decided to buy a RO system. The installer, Jim, was awesome! Took care of everything without any issues, even plumbed the fridge for me. Fast forward a couple months. The system developed an odd shudder like there was air in the lines. After calling and speaking with the owner he said the assistant would call me back to set something up to fix it. Well.... it never happened. Not a big deal as the issue resolved itself. But still, kinda disappointing. Fast forward 1 year and a couple months after install. Time to replace the filters. 240$ later I am happy as a clam. Kristina finagled me a late appointment, MUCH appreciated. Jim showed up on time. He not only replaced my RO filters but helped me with my water softener. Final verdict With out Jim this company would be probably be bankrupt. Otherwise, the work is quality and will last. Worth every penny. Just make sure you ask for Jim. Great people person and outstanding tech. They are a team of professionals who are looking out for your health. Jim is an excellent technician. Christina is helpful and understanding. She goes above and beyond to take care of the customers. I've been with this company for 18 years. They have a great friendly customer service staff and Servive staff. They always accommodate my schedule. Their customer Service always remembers to send me reminders for the annual service and they have a no pressure sales. If I can't meet with them one year they remember to send me a reminder the next year. Their service representative is always friendly and informative and professional when at my house and does excellent work. They definitely deserve a five star rating. If I could give the Pure Water Team 10 stars I would!!! We just had our new water treatment system installed and could not be happier.The customer service is outstanding. From start to finish they kept us informed. Our water is so terrible and we have had several different systems installed trying to correct the problem. No other company has went into the details and testing of our water as thoroughly as Pure Water has. They gave us the information we needed and upfront pricing with no hidden fees. I cannot say enough positive things about this company as our experience has been wonderful and our water is now great! I will refer them to anyone I know from now on who is looking for a filtration system for their home. Thank you!